La Taverna @ Fratelli's located on our 1st floor opens daily for lunch from 12pm Monday-Sunday and dinner Wednesday - Sunday from 5pm. 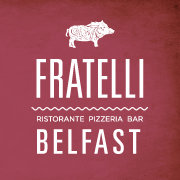 Fratelli is an Italian Restaurant & Bar and is part of the Galgorm Resort & spa family. Oozing rustic Italian charm with a contemporary edge. Bringing a taste of Galgorm to Belfast. Excellent Meal, and great value for money. We had a lovely relaxing meal at Fratellis on Tuesday evening before the Opera House. Can't wait to eat again in Fratellis in the coming weeks. Lovely evening, great atmosphere, excellent food and friendly service. Really good food and service. Thanks to our waiter Lewis, who was very friendly! Had a lovely time, service was outstanding. When we arrived we were asked what was the occasion, as it happened, it was my husbands birthday, and within 10 mins, a complimentary glass of Prosecco arrived at the table, which was a lovely treat! Many thanks, throughly enjoyed the atmosphere, food and staff were super! service absolutely amazing as always, staff couldn't do enough to make sure we enjoyed our night. Entertained some visitors from England here and they, like us, were mightily impressed. Value for money on a 2for1 Monday evening is unbeatable. Staff are welcoming, friendly and attentive. Thoroughly recommended. Service was a bit slow at times. On two occasions I had to go to the bar and ask for service to order our sweets and ask for the bill. The food was good quality. Fantastic food and great atmosphere!! Food was excellent . Service was superb . Every member of staff was pleasant , helpful and efficient . I look forward to returning in the future . Lovely experience all round ...will definitely be back. We dined Saturday evening and has a fantastic dinner and excellent bottle of Chianti. Service was very good. Chef created a garlic free meal especially for me with a smile! We were there at lunchtime on Saturday but the restaurant was almost empty with only empty tables around us which meant there was no atmosphere although it is beautifully decorated & furnished. We said we will definitely go back in the evening time when it is likely to be busier & have a buzz about it. Our waiter was really good & the manager came over & checked everything was ok with us. Staff were extremely helpful and courteous. As always the service from Ray and the team was exceptional! We both really enjoyed our meals in Fratellis. The food was excellent and service very quick with friendly staff. Food portions were plentiful and two for one deal on Monday is very good value. Lovely ambiance. Fantastic service. Good food. A little on the expensive side. That said, I will return. Very expensive and portions far to big plus alcohol very overpriced. Also the Macaroni E Prosciutto was very dry and made eating it difficult, it could have done with more of the creamy white sauce. Waitress was asked what the Fish Gratin starter was to which she replied, “Fish”, think we gathered that by the title it was in the dish somewhere, but more detail of ingredients etc would have been nice to know so in the end we settled for different starters.